Hummingbirds in the landscape are fun, entertaining, and beneficial. They eat insect pests. They also help pollinate flowers. 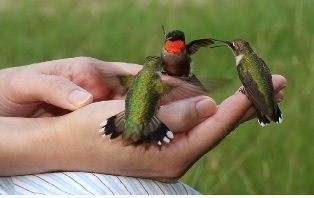 The most popular way to attract them is with hummingbird feeders. There are many different kinds, both functional and decorative, and all work to some degree. Red food coloring is not necessary because the feeders are usually colorful enough. The best nectar to use is made with 1 part sugar and 4 parts water. Boiling the nectar solution cuts down on harmful pathogens. Keep the feeders very clean and change the nectar every few days. Putting out multiple feeders will allow more hummers to visit your garden as some birds are very territorial and will not allow others to drink at their feeder. 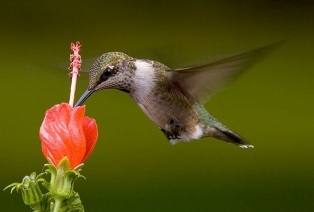 Nectar is only a part of the hummingbird diet. A very large and important part of their diet consists of insects that provide the protein necessary for their good health as well as that of their young. They are so fast that they can capture insects in mid-air, but they also find insects in flowers. Planting lots of flowering plants is the other important thing to do. Some flowers provide nectar, others may harbor insects, and brightly colored flowers simply pique their curiosity. To attract hummingbirds, here are some of the best planting choices: Salvia Spires, anisacanthus, abutilon, Mexican honeysuckle, queen’s crown, turk’s cap, cupheas, coneflowers, buddleias, bougainvilleas, hibiscus, zinnias, impatiens, petunias, lantana, and most any other colorful flower. Also learn more at these links: Hummingbird Slide Show, Hummingbird Birth, Hummingbird Fly Zone.